Everyone’s talking today about smart home technology. This is something we’ve all waited our whole lives for… walk into a room and say “lights” and the lights turn on. Warm up the oven on your way home, and stop worrying about whether the toaster’s still on because you can turn it off from anywhere on the planet. Smart home technology isn’t just one thing. It’s a whole lot of different things. Smart home includes outlets that are connected to Wi-Fi so they can be controlled remotely. Smart home tech uses light switches that work with multiple “scenes.” It’s an internet-connected assistant that answers your questions in plain English. It’s one button to order detergent when your washer tells you it’s low. Smart home is the future. Best part is, it’s here now. In order to make your home a smart home, you need to install something like our 15A Smart WiFi Outlet w/ USB and Light for Home/Office. This replaces the outlets in your home and lets you control your devices with an app. This outlet is the top of the line. In addition to being smart home enabled, you get USB charging and the ability to turn the USB ports off independent of the outlets. You even get a nightlight that automatically turns on when the lights are off. The outlet comes with full Alexa and Google Home compatibility, too. There isn’t a more capable outlet on the market. 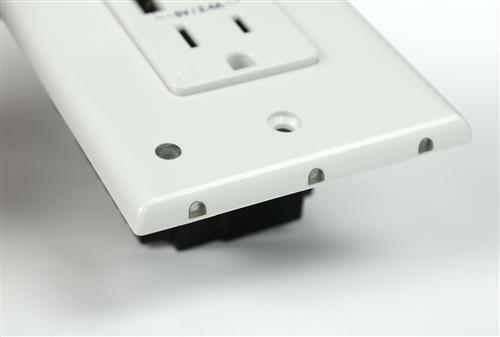 The smart outlet comes in the modern “decora” style that’s been popular for some time, and it also comes in black. That means that it should work in almost any home. If you still have the old-school beige outlets, you’re probably thinking about replacing them anyway, so why not go full-on “smart home?” It’s definitely time. We’re giving away one of these smart outlets to a lucky commenter. All you have to do is leave a comment here or on one of our social channels. One name will be chosen at random to win a smart home adapter. There is no purchase necessary and I’m sure our attorneys would want me to say something like some restrictions apply. But bottom line folks, leave a comment and tell us how your smart home projects are going. We’d love to find out more. DEVELOPING: Samsung using Smart TVs to spy?